Conifex Inc has taken another major step forward. Recent improvements at the company’s Fort St. James operation are resulting in the manufacture of more higher valued lumber products. Upgrading the lumber handling and finishing phases at the mill complex has also translated into a smoother, more efficient product flow. Conifex invested about $31 million in the projects at the mill, located in north central British Columbia. The projects have contributed to a significant two to three per cent drop in trim loss and a 12 to 15 per cent increase in the manufacture of prime J and Select grade lumber products. The phased projects began in the planer during the spring of 2010.The reason for the planer upgrade was to match or exceed the sawmill’s production while reducing trim loss and improving grade out turns, summarizes Roy Helmkay, Conifex’s vice president of operations, who is based in Fort St. James. Planer superintendent Troy Bruvold (right in photo) with operator David Pierre. Improvements at the Conifex mill included a planer upgrade to match or exceed the sawmill’s production while reducing trim loss and improving grade out turns. Prior to the upgrade, Conifex had to make use of an auxiliary planer to keep pace with sawmill production. Now the planer and the sawmill both operate on a two shift daily basis, allowing the second planer to be decommissioned. Upgrades to the planning process are dominated by Comact equipment and were installed by DelTech, of Prince George, B.C. Highlighting the package is a Comact GradExpert automatic lumber grading system, which Helmkay credits with doing a very consistent job. “Much of the work we did in the planer was done to increase productivity and also create a smoother flow,” explains Helmkay. The process includes eradicating flow bottlenecks that can cause congestion and slowdowns. A new transfer deck and drop-out for culls was installed on the infeed to the planer. 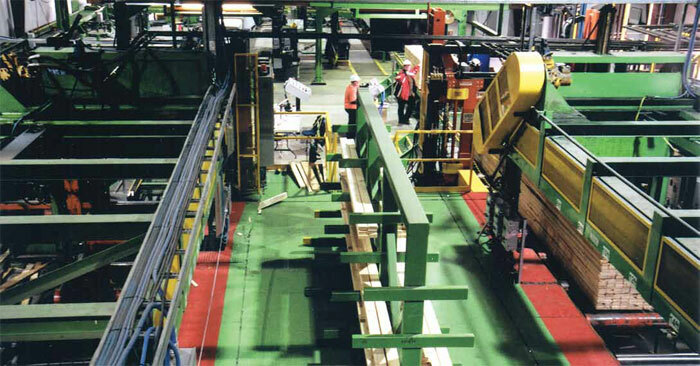 The addition of Mitsubishi variable frequency drives supplied by Arrow Speed Controls on the infeed was a further improvement to better sequence lumber for a smoother flow through the planer. A Wolftek tensing system to the top rolls helps drive lumber through the planer. Applying a more constant pressure equates to fewer problems. Following upgrades, the 20 knife Stetson Ross planer now has 26 knife heads top and bottom and 24 knives on the side heads to help achieve more throughput and speed control. A 40-bin Comact sorter was added to complement the existing 35 bins. Existing equipment was used and improved upon where feasible throughout the upgrades. Ahead of the new sorter line, a second Comact precision end trimmer with dedicated sawbox was added. The top of the existing sorter was converted with the addition of a drag chain so both sorters can operate at speeds up to 220 lugs/minute. “These improvements give us the ability to pull more products and run at faster speeds,” says Helmkay. Out in the mill yard, a new 150 foot DelTech dry kiln (right) was installed, heated by a new thermal oil system fired by natural gas. Two existing kilns were also converted to thermal oil heating use. Samuel ink jet grade mark printers are used on both transfer decks. The ink jet printers apply not only grade stamps, but also graders’ initials and board specific details. A new feature integrated on the grade stamp system is a zero downtime operation that can be manually selected or automatically switched when interfaced with an integrated vision system. With the integrated vision system, any drop in print quality will automatically change the grade stamp to the alternate print heads. The addition of a new high speed Comact stacker, a new Samuel bander and modifications to the existing end press were also among the back-end planer improvements. Out in the mill yard, a new 150 foot DelTech dry kiln was installed, heated by a new thermal oil system fired by natural gas. Two existing kilns were also converted to thermal oil heating use. The three thermal oil-heated kilns are responsible for about 80 per cent of the mill’s drying duties. The thermal oil improves lumber drying and provides more even temperature control, he continues. Hold-down restraints on the top lumber packages in the kiln restrict the likelihood of warping. “Between the thermal oil, the hold down restraints and the GradExpert in the planer, we’ve been able to reduce trim loss and pick up grade out turn,” summarizes Helmkay. The production increase of Select and J-grade primes is also, in part, a function of longer pieces delivered by the sawmill, allowing better optimized cut solutions in the planer, notes Troy Bruvold, planer superintendent. In the sawmill, a new Nicholson A8, 22 inch double ring debarker comprised another part of the integrated upgrades. Its primary purpose was to increase throughput in the mill, continues Helmkay. The A8’s double ring feature applies less pressure on the logs, helping to reduce fibre tear, and the machine does a consistent job of bark removal, he says. The increase in throughput, the improved log flow and the reduction in fibre tear combine to produce a higher lumber recovery factor, an increase in grade out turns and quality bonuses from Conifex’s wood chip customers. Conifex is a relative newcomer to sawmill ownership in north central B.C. In 2008, the privately-owned company purchased the shuttered Fort St. James sawmill complex and associated wood basket from financially-troubled Pope & Talbot. In 2010, Conifex picked up AbitibiBowater’s bankrupt assets in Mackenzie. They included a closed newsprint mill, two sawmills and associated timber cutting rights. Conifex plans to operate one upgraded sawmill in Mackenzie. 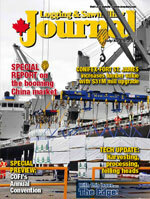 The Fort St. James sawmill’s annual production capacity is approximately 300 million board feet. Welco Lumber Corp in Vancouver is the exclusive marketer of Conifex’s lumber production. Future plans for Conifex include bioenergy in B.C. Ken Shields, Conifex Inc’s president and CEO, has been refreshingly candid and forthcoming about the company’s corporate plans and expectations of forest industry growth and diversification. Shields describes Conifex as a significant regional player with good access to competitively priced fibre and a well-thought-out business plan. “We’ve got the fibre and that underpins our business but it goes beyond lumber and makes us a partner for biomass projects,” says Shields. Conifex has announced plans for a $45 million bioenergy project in Mackenzie contingent upon successful negotiations with BC Hydro to purchase the energy produced. 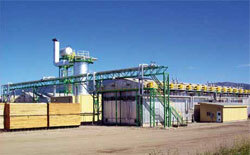 Wood pellet manufacturing and/or wood fibre-fired electricity production are on the radar at Fort St. James. Conifex’s analysis indicates the mountain pine beetle might have infected about a billion cubic metres of wood in B.C. Supply shortages are anticipated although Fort St. James and Mackenzie wood baskets are not as severely impacted as those in other interior districts. A wholesale restructuring of the newsprint business in eastern Canada and a gradual improvement in U.S. housing starts (1.7 million units annually predicted by 2020) will boost lumber prices, anticipates Conifex.